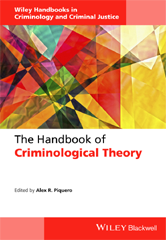 Bringing order and insight to a vast field that is constantly evolving, this handbook provides up-to-date, in-depth summaries of the most important theories in criminology, from classic deterrence theory and social disorganization to modern labeling theory and integrated theory. These original essays are clearly and accessibly written by top scholars in the field as well as up-and-coming scholars. Why do adolescents engage in crime? Should Adolescents be Treated Differently for Their Crimes? What is a Control Theory of Crime? Results: How Do Criminologists Use R2? Routine Activity Theory: A Missed Opportunity? Rational Choice Theory: A Good-Enough Theory? Situational Action Theory: A Better Alternative?